A charming detached three bedroom barn conversion with a delightful front & rear aspect is offered for sale with no onward chain. Believed to have been converted in the 1980's this grade II curtilage listed property enjoys a 17' 3" kitchen/breakfast room & L shaped sitting/dining room with two doors opening out into the rear garden. Also on the ground level there is a hall & cloakroom. Upstairs houses a master bedroom with ensuite shower room, a 17'4" double bedroom, a third single bedroom & family bathroom. 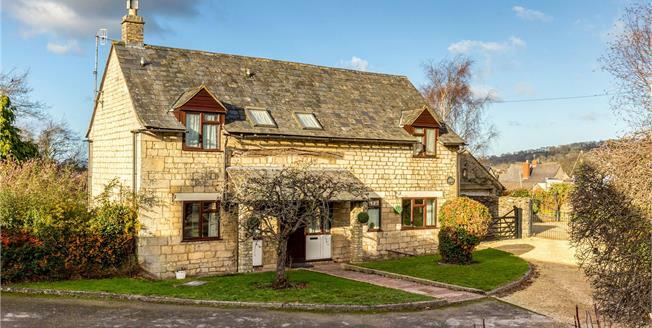 The property enjoys character features such as exposed Cotswold stone & attractive timbers and is warmed by gas central heating. In the historic village of Kings Stanley there are several small shops, Post Office, primary school, inn, a playground, sports field, hairdressers and Parish Church. An excellent selection of schooling is found in the area including state, independent and two grammar schools. There are train services at Stonehouse (2 miles) and Stroud (4 miles) that travel to London (Paddington). Junction 13 of the M5 motorway is just 4 miles distant which gives access to Gloucester, Cheltenham, Bristol & Cardiff. A fabulous award winning farmers' market takes place on Saturday mornings in Stroud. For the keen walkers the Cotswold Way National Trail can be found on the edge of the village. A five bar gate opens onto a drive which leads to a large detached garage 19'5" x 16'5" with electric door. There are grounds to both front and rear. To the front the garden is an open plan semi-circle with a path leading to the impressive front door. The majority of the plot is at the rear. A patio lies directly outside the property with steps down to an enclosed level lawn, Shrubs. Trees. AGENTS NOTE: We are awaiting clarification from the solicitors in regards to the access.